This guide shows how to apply for and approve leave on the web, mobile applications and the Deputy Kiosk. Leave Management in Deputy will make your rostering and payroll a breeze. Our Leave system will allow you to create and export annual leave, sick leave, time in lieu and compassionate leave, amongst others. Your employees may apply for it via the smartphone app, Kiosk, or website. Alternatively, you may create it for them. On the website, please click on your profile found in the top right corner of your screen. From there, please scroll down to "Leave", then click "Add New". Now please select the beginning and end date of the leave. If the first or last day of leave will not take a full day, please deselect "All Day" and select your starting or ending time. This will allow you to take part of a day off. After selecting the first and last days of leave, please add a comment with some information about your request and the type of leave you need to take. Finally, please choose the manager to notify and click "Add". This will send the request to your manager. First, please open the Deputy app. Next, tap "Profile" on the right of the Navigation Bar. On your Profile screen, please tap "Leave". On the resulting screen, please click the "+" symbol in the top right corner to create a leave request. Next, please fill in the details of your leave request. You will need to add a comment and choose a manager to notify. Check all the details, then tap 'Done' when you are finished. First, please log in to the Kiosk. Next, please click the blue "+" symbol to the left, and select "Leave". 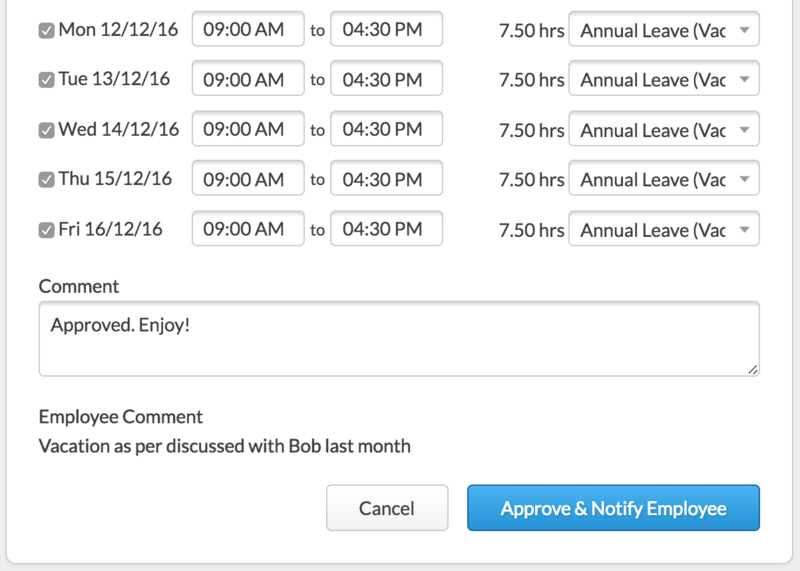 In the popup, please enter the starting and ending date of your leave, as well as a comment detailing your request, and nominate a manager or managers to notify. Finally, please click "Request Leave". 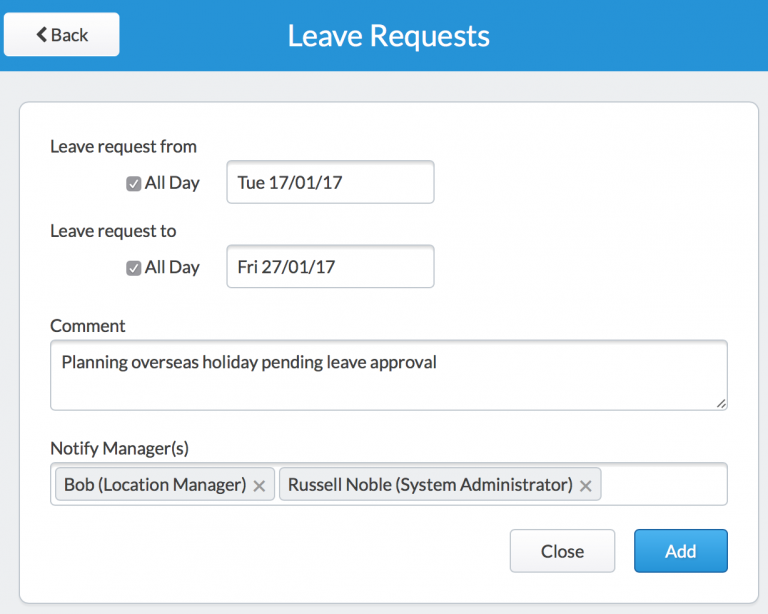 Location Managers and System Administrators can use the Availability & Leave Report to quickly access pending leave requests and see any employees currently on leave for the selected time period. You may access the Availability & Leave Report by clicking "Reports" on the Navigation Bar, then clicking either the name of the Availability & Leave Report (first report on the left), or the "Run Full Report" button just below it. At the top of the Report, please select your location and date using the selectors. Regardless of the date chosen, you will be shown pending leave requests for the selected location. To view leave requests from all locations, please select "All Locations" in the location selector. For further information on Reports, please read our article. If you are the nominated supervisor when an employee requests leave, you will be sent an email or push notification. As a Supervisor, you may approve only the date range of the leave request, not which type of leave to be taken. To access the leave request, please go to the People page, find the relevant employee, then click "View" to the right of the employee's name. Next, please scroll to Leave, where you will see any outstanding leave requests. To go directly to that Leave request, please click the 'View' button that corresponds to the leave request. If you wish to decline the leave, please click "Decline Leave", then click "Decline & Notify Employee". Please leave a comment explaining why the leave was declined. 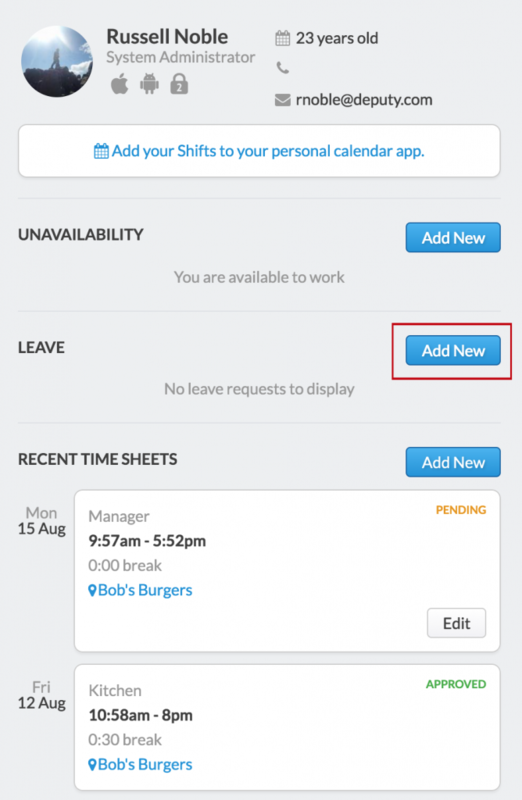 When viewing the leave request, you will be notified if the employee has any rostered shifts in the designated period. 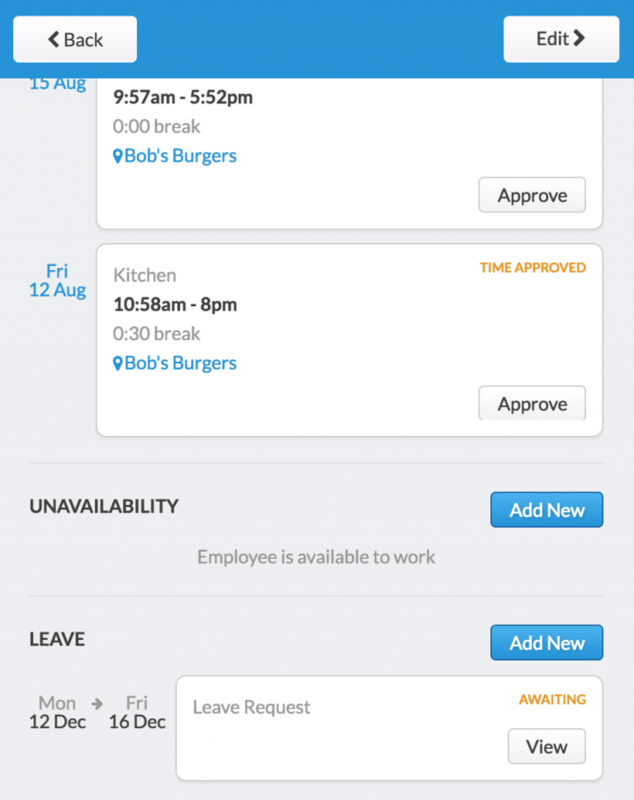 If they have shifts, you will have the option to either remove them from their shifts or to make the shift "Open", allowing it to be claimed by any appropriately trained and available employee. 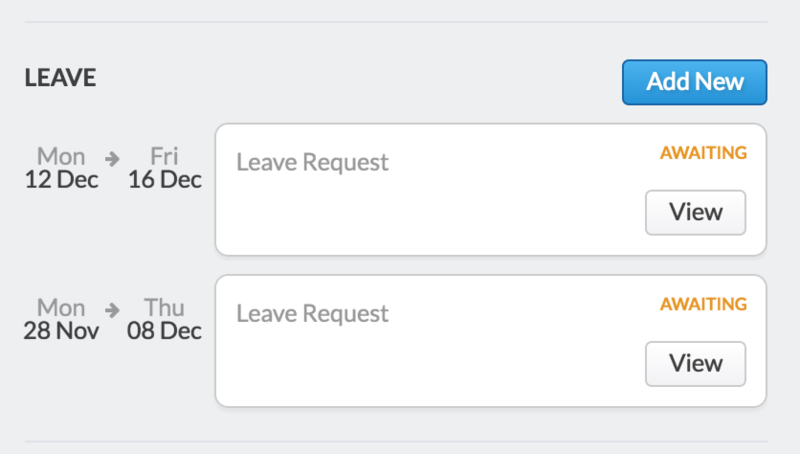 When approving the leave request, please select "Approve Date Range", then below that "Approve Date Range & Notify Manager", then select a manager to pass the leave request to. If you were the designated manager, you will receive a notification when an employee requests leave. If not, you will still be able to approve or decline the leave, but will not receive a notification. To approve or decline an employee's leave, please go to the People page, then click "View" to the right of the relevant employee. 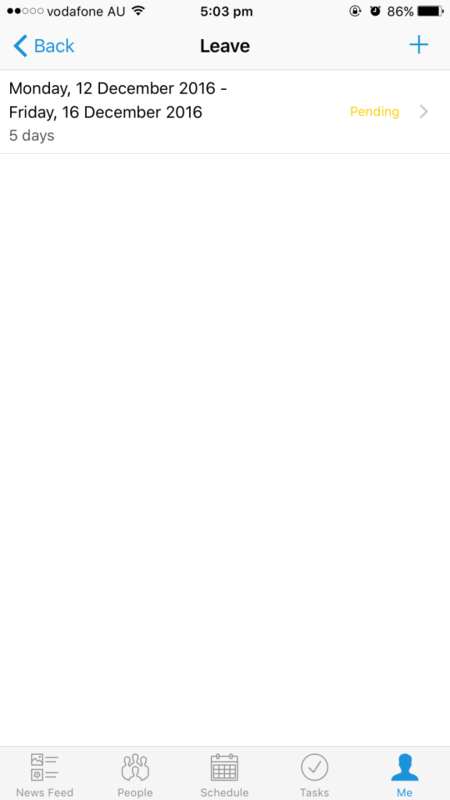 Next, please scroll down to "Leave", where you will see the pending leave request. Please click 'View' next to the leave request. If you wish to decline the leave request, please click "Decline Leave" beneath the dates, then click "Decline and Notify Employee." To approve it, first please click "Approve Leave". 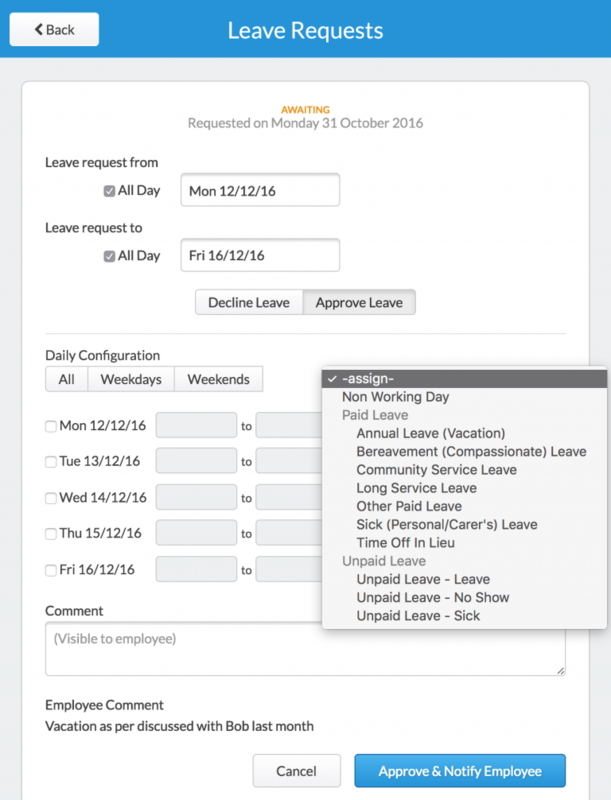 Next, you may select which type of leave is to be applied for each day of the leave request. To do so, please click the checkbox next to each day to select it, then click the type of leave above the list of days. For days on which the employee would not normally work, please select "Non Working Day". For other working days, please select the relevant type of leave as shown above. After selecting the type of leave for a given day, you will be able to specify which times the leave applies from and to. 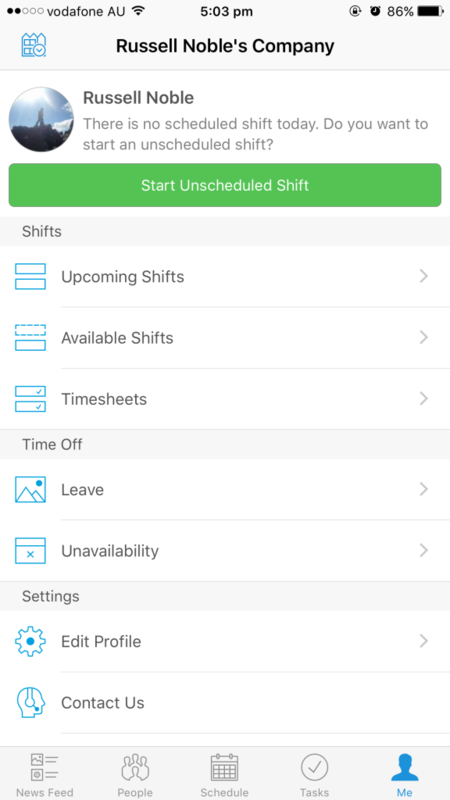 By default, it will be created using your location's opening time plus the default length of a shift there, minus the length of the default break. If your location opens at 9am and the default shift is 8 hours with a default break of 30 minutes, the leave time will be given as 9am - 4:30pm, meaning that your employee will be paid for 7.5 hours. Before approving the leave, please ensure that all of the times are correct. 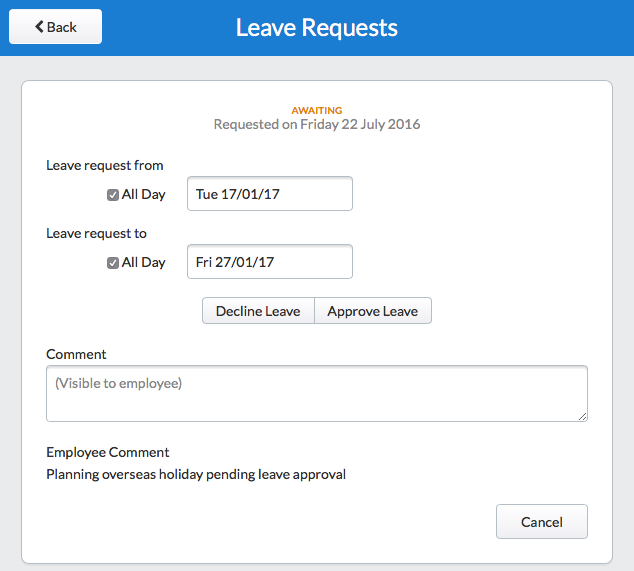 If the leave is in the past, approving it will generate timesheets for those days in the past. 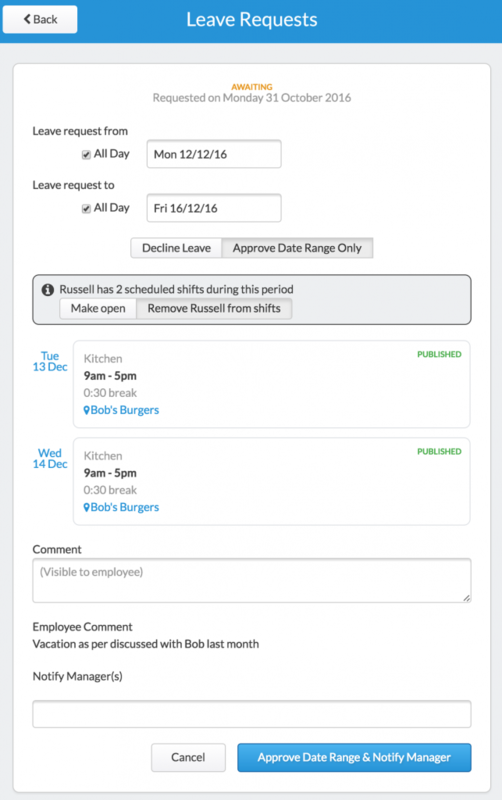 If the leave is in the future and is approved, the system will create timesheets as those days past. Either way, you will need to manually edit each timesheet if you do not set the time correctly to start with. 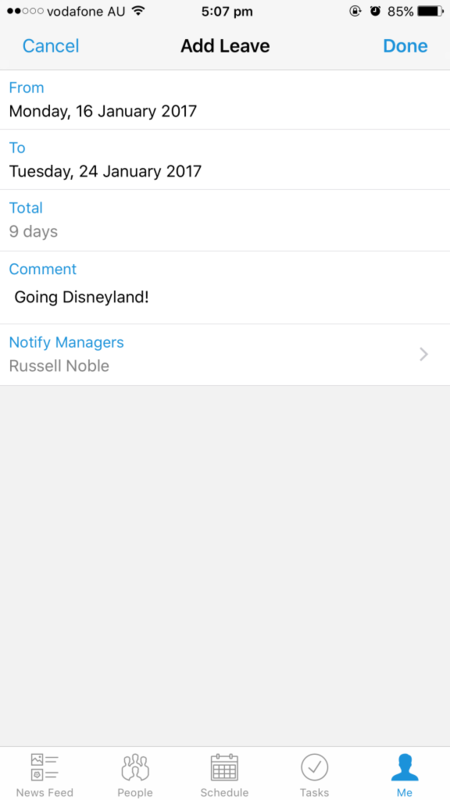 After you have designated each day with the appropriate leave, please click "Approve Leave and Notify Employee". 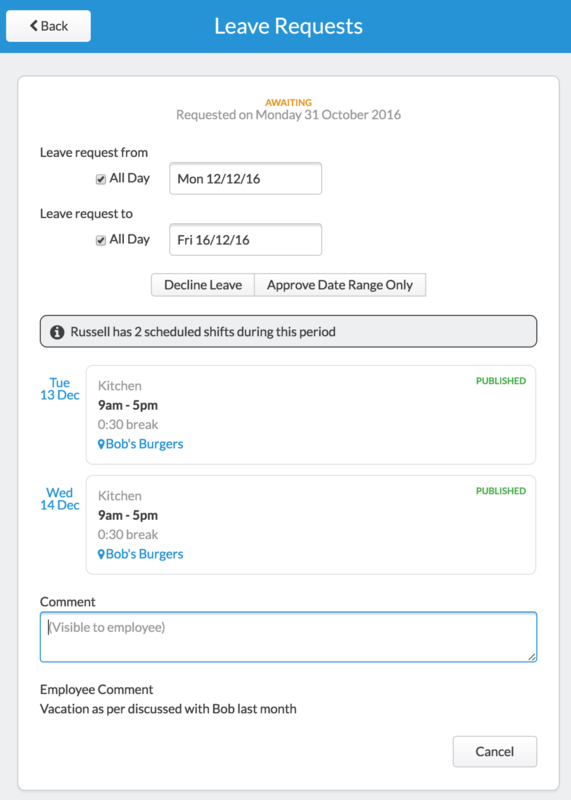 You may view the leave timesheets as you would your regular timesheets, that is by going to the Approve Timesheets page then selecting the date range according to the leave request. 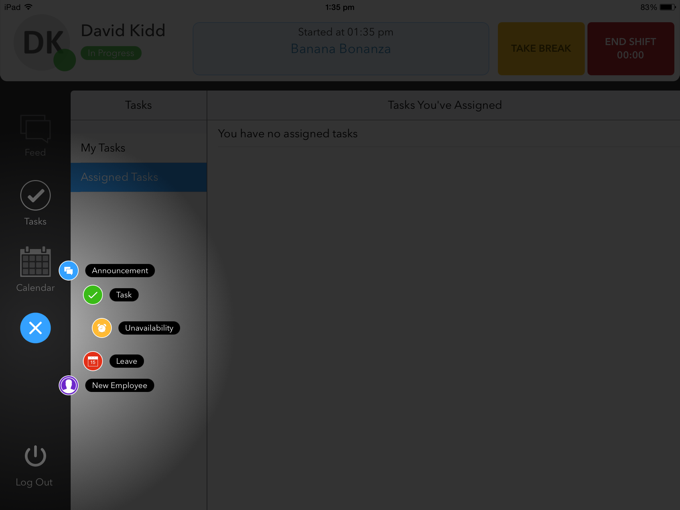 Newly released in Deputy is the ability to export Leave. 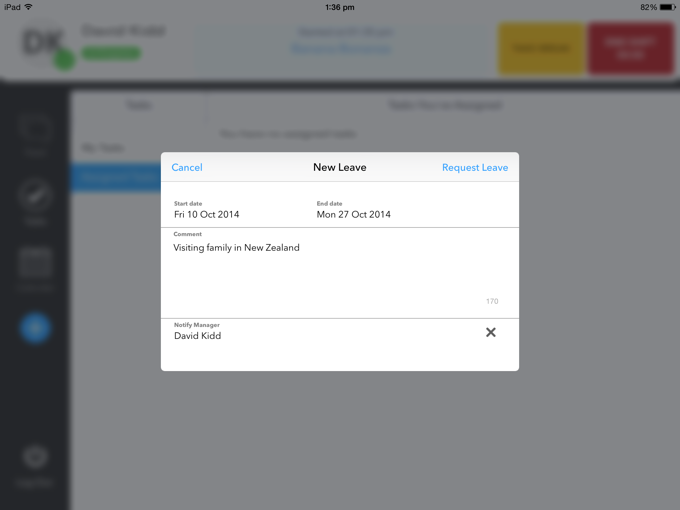 Leave can be exported to Xero (AUS), Zenpayroll, MYOB, SmartPayroll, and WageEasy. For instructions on how to export, as well as which types of leave may be exported, please see the relevant payroll article.